Could you afford to buy in your own neighborhood today? For many homeowners on the Wasatch Front, the answer would be no. (Leah Hogsten | Tribune file photo) Homes in Utah’s Daybreak in South Jordan. A new analysis suggests that the state’s housing affordability problems are also affecting existing homeowners, many of whom would not be able to afford a new home in their own neighborhoods today. Utah’s ongoing housing affordability crunch isn’t just squeezing renters and first-time homebuyers but it also has impacts on existing homeowners still paying off their mortgages, a new analysis suggests. 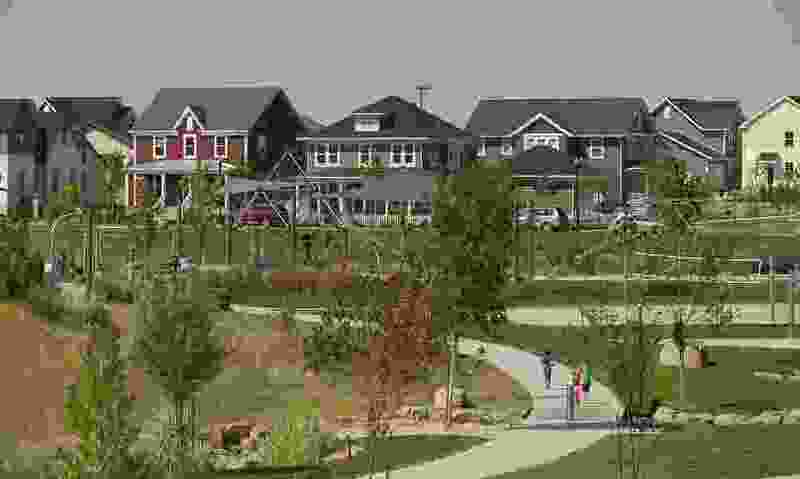 As pay gains continue to lag behind rises in home prices, large numbers of these Wasatch Front residents could not safely afford to buy a house in their own neighborhoods, according to a study by bestneighborhood.com, a website devoted to national real-estate data. Dampening home sales overall, it’s thought those conditions may force people not to move, or to choose less-expensive neighborhoods or smaller homes, or live further from their workplace than they might have otherwise. The analysis, based primarily on U.S. census numbers on income and home values combined with proprietary data, finds that as many as half of Salt Lake City homeowners still making house payments would struggle to qualify for a bank loan to buy a home where they now live, or would not qualify at all. Statewide, about a third of such households are in the same situation, the site’s research indicates. And in a few of Utah’s more rapidly growing communities — places like Herriman, Saratoga Springs and Eagle Mountain — the share of households whose owners probably could not safely afford to buy in the same area is as high as two-thirds. Nationally, according to bestneighborhood.com, that number hovers around 27 percent, or one in four homeowners, representing nearly 88 million Americans. And the ratio spikes as high as 70 percent or above in the country’s hottest markets, centered on both coasts but particularly in California. “There is not enough growth in income to sustain rising prices, and many families would be priced out of their own neighborhoods,” writes Carson Ward, a Midvale resident and co-creator of bestneighborhood.com. The study points to the wide impact of Utah’s dramatic rise in home prices, which have seen an average annual increase of 5.7 percent since 1992, according to a seminal study published in May 2018 by the University of Utah’s Kem C. Gardner Policy Institute in Salt Lake City. And while that trend has affected Utahns at all income levels, according to James Wood, an economist and senior fellow at the institute, those in households earning below the state’s median income levels have been disproportionately harmed. One in eight Utah households — or about 120,000 in total — spends more than half of their incomes on housing, according to Wood. Ward, who launched the bestneighborhood.com in December, said the site’s affordability study took a cautious approach on its estimates, adjusting for existing household debt and other factors. It also screened for renters as well as homeowners who’ve paid off their mortgages, on the assumption they could more easily qualify for a new loan. And while most housing advocates deem residents as “cost burdened” when they spend more than 30 percent of their incomes on housing, the site defined homeowners as “stretching” to qualify for a loan when they had to shell out between 36 percent and 43 percent of their incomes on mortgage payments. Estimates at the state level have pegged the gap between new family households formed and new homes built at about 43,500 dwellings. Housing officials for Salt Lake City say Utah’s capital lacks at least 7,500 apartments affordable to low-income renters making $20,000 or less. Demand for housing continues to grow with the state’s healthy economy and high birthrate. At the same time, homebuilding costs are also being pushed up by a variety of factors, such as escalating prices for key building materials like lumber and steel, construction labor shortages and dwindling supplies of undeveloped land in more populated areas. Combined, these trends — and the possibility they could begin to slow Utah’s economic growth — have recently put affordable housing near the top of many political agendas, capturing the attention of homebuilders, business leaders, City Halls across the state and policymakers on Utah’s Capitol Hill. And regular Utahns are increasingly worried about the issue as well, according to an October 2018 poll by the nonprofit Utah Foundation. According to new data generated by Wood, monthly mortgage payments on a median priced home in Utah have spiked in recent years, rising by 56 percent between 2013 and 2018, from $1,167 to $1,821 per month.